When Subaru revealed the Viziv Performance Concept at the Tokyo Motor Show, there were many rumblings that it previewed the next Subaru WRX. 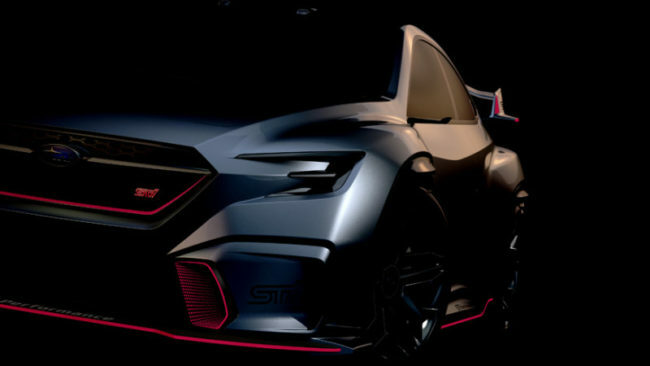 That possibility seems much more likely now that we’ve had a glimpse at Subaru’s concept for the Tokyo Auto Salon, the Viziv Performance STI Concept, which could be a preview of the next WRX STI. Though we only have a couple teaser images to work with, we can clearly see that it’s a flashier machine all-around. In the grille is the trademark pink STI badge, and it’s matched by pink accent lines in the grille, the front lip spoiler, new air inlet, side skirts, and on the rear wing. And in true STI fashion, the rear wing is enormous. It also looks like the fender flares may be slightly wider than the standard Viziv concept. Other than what we can see, we don’t know much else about this concept. Since it’s a Subaru, it’s sure to have a flat-4 engine and all-wheel drive. We can also make out the roof sensors from the last Viziv, indicating that this, too, will have fancy driver assistance systems. And if the development of the Subaru Ascent from the Viziv-7 is anything to go by, this concept will probably lead to a production model. As we’ve said before, though, we’d caution Subaru fans against high hopes, since Subaru has already shown in the past that its concepts don’t always translate to production.